Alan Hansen lifting the first of three European Cups. Pic courtesy of Mirrorpix. A remarkably skilful and composed defender, Alan Hansen was a cornerstone of the dominant Liverpool side which swept to domestic and European glory throughout the eighties. Born in Clackmannanshire, Alan showed promise as a junior, but almost turned his back on football in favour of a professional golfing career, rejecting the offer of a contract from Hibernian. He eventually joined his brother John at Partick Thistle, breaking into the first team in his second season at the age of just nineteen. The younger Hansen caught the eye at the Firhill Stadium, helping the club earn promotion to the Premier Division, and the promising defender was recommended to Bob Paisley by Celtic counterpart Jock Stein. Liverpool duly paid £110,000 to bring him to Anfield in 1977. Hansen made a modest number of league appearances, but ended his debut season partnering Phil Thompson in defence for Liverpool’s European Cup Final triumph over Club Brugge. The young Scot cemented his place in the team the following year, forming part of a championship-winning defence that conceded just sixteen goals in 1978/79. Long-serving captain Emlyn Hughes left that summer, allowing ‘Jocky’ to assume the role of first-choice centre-half. Liverpool preferred to play the ball out of defence, and in Hansen, they found a young centre-back who could do just that. Graceful on the ball and perceptive without it, Alan was an assured and calming presence at the back throughout one of the most successful periods in the club’s history. 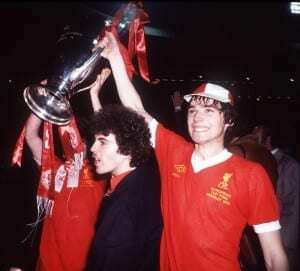 Alongside Kop stalwart Thompson, Hansen lifted the league title again in 1980, and was present again when Liverpool clinched the League Cup and European Cup the following year. He went on to form a lasting relationship with Mark Lawrenson in the heart of defence. 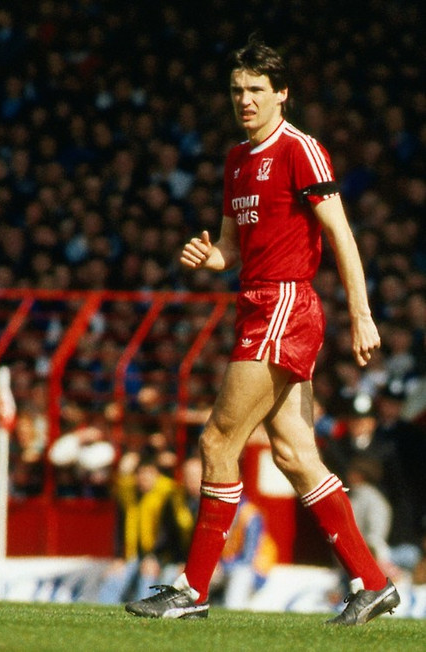 A cool and composed centre-half, Hansen featured over 600 times for Liverpool. Pic courtesy of Mirrorpix. Together, they steered the Reds to two consecutive league and League Cup doubles, retaining both trophies and adding a European Cup in 1984/85. With Hansen serving as skipper, Liverpool clinched a bona fide league and cup double, defeating Everton in the FA Cup final, and featured in the second leg of the Super Cup triumph, thrashing their fierce Merseyside rivals 7-2 on aggregate. Hansen was controversially overlooked for the Scotland squad ahead of the 1986 World Cup in Mexico, but remained a key figure for Liverpool for the next two years, guiding the club to another First Division championship in 1988. Persistent knee problems limited Hansen’s contribution in 1988/89, but he still featured in yet another defeat of Everton – an extra-time victory in the FA Cup final – and recovered to lead Liverpool once again towards the turn of the decade. The Reds romped to another league title – Hansen’s eighth, an individual record at that time – in what proved to be a fitting swansong for one of the club’s great modern defenders. In fourteen years at Anfield, Hansen had made 620 appearances, and lifted no fewer than twenty-three trophies during Liverpool's golden era. Upon retiring in 1991, Alan moved into punditry with Sky and later the BBC's Match of the Day, becoming one of the country’s foremost authorities on football and a Saturday night mainstay on terrestrial television for over two decades.